The next film by Moon and Source Code director Duncan Jones is based on a comic character from the 2000 AD strip. 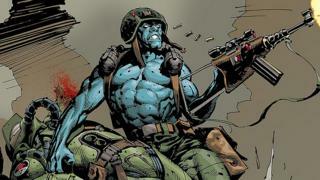 Rogue Trooper is a blue-skinned, mohawk-sporting, genetically-engineered soldier who debuted in print in 1981. Chris Kingsley, co-founder of Oxford-based publisher Rebellion, said Jones had a “unique level of commitment and passion” for the character. Jones, who also directed Warcraft and Mute, said he was “so excited” to bring the character to the big screen. Rebellion has recently been branching out into live action adaptations of its properties and last year announced a Judge Dredd TV series was in development. Rogue Trooper was created by writer Gerry Finley-Day and artist Dave Gibbons. Jones, who is the son of iconic rock star David Bowie, said: “For years now, I have felt a sting as Marvel and DC have poured out their entire comic roster into film.